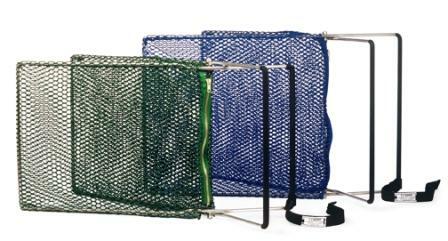 Easy grabbing net designed to catch animals &pets quickly and efficiently. Injections of tranquillizers and vaccines can be given through the net making it a very effective animal handeling tool. Ensuring safety for animal handlers, saving incredible amounts of time, and providing dozens of uses, the EZ Nabber is a very smart and sound investment. In addition to providing a safe and humane way to capture animals, aseptic intramuscular injections of tranquilizers, anesthetics and vaccines can be given through the net. Pets can be transferred from one cage to another without injury or stress to the animal or the practice staff. Pets can be removed from and/or placed in pet carriers. When the net becomes soiled, leave it on the frame and wash it in the tub with soap and water: use a disinfectant if needed. Abscesses and wounds can be flushed, and the pet can be bathed in the net. Our new 14” frame fits 18” x 18” cages. Great price, super fast shipping, and good customer service! From Anonymous of Logan, Ohio on 11/24/2018 . 1/4/2012 – How do these work? How do you set them?